This is a port of the handheld game from 2010 and is the sequel to the Game Boy Color video game Shantae. Things had been quiet in Scuttle Town since Shantae's clash with the pirate Risky Boots. During the annual Relics Hunters Expo, she and her friends see fellow Relic Hunter Uncle Mimic unveil his latest find: an ordinary-looking lamp encased in stone. Just as they begin to wonder what it is, the notorious Risky Boots crashes the expo and steals the lamp. Despite the quick battle, Shantae is knocked out, allowing the vengeful pirate to get away. Blaming the half-genie for the town being in disarray and failing to do her job properly, the Mayor of Scuttle Town fires her as the town's guardian. Despite no longer being a Guardian Genie, Shantae still decides to take responsibility to stop Risky Boots' newest plot. Is there more to this mysterious lamp than one expects? And what does the evil pirate intend to do with it? 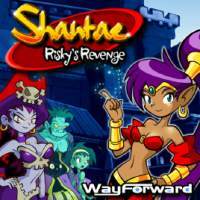 Players take the role of Shantae, a half-genie who must explore various areas in order to stop her nemesis, Risky Boots. Shantae's main form of offense is attacking enemies with her hair, though she may also acquire magic spells that allow her to use various ranged attacks. In order to progress through the game, Shantae needs to find various transformation spells. These spells, activated by performing a belly dance, transform Shantae into various animals with unique abilities. These include a monkey that can cling onto certain surfaces and dash between walls, an elephant that can smash rocks to open new areas and a mermaid that can swim underwater. Players will navigate half-genie heroine Shantae through deserts, enchanted forests and more while solving puzzles and mastering the art of belly dancing. Among other enhancements in the Director's Cut, beating the game will unlock a new game mode called "Magic Mode" in which Shantae is wearing the "Dancer Costume" seen in the iOS port, providing less magic consumption, but also less defense. It presents an added challenge for experienced players.